With John Hutton set to announce a new generation of nuclear power stations for the UK today, it raises the issue of what price such a benefit would be. Whilst it cannot be denied that our current generation would benefit from nuclear energy generation, it will be future generations who will carry the detriment of the legacy that remains. Future generations will carry the burden of policing it, paying for it as well as suffering the consequences if /when disaster strikes, which would result in substantial additional economic, environmental and social costs. Whilst we were not fully aware of the potential future consequences back in the 1950's, or were reckless in proceeding without understanding those consequences and detriment to others, we now carry the knowledge of the inherent risks and costs to future generations. With that knowledge comes the responsibility to ensure the highest possible standards of safety and damage limitation strategies are imposed. Likewise, with it comes the duty to implement a programme of cessation of current use of nuclear as soon as possible. 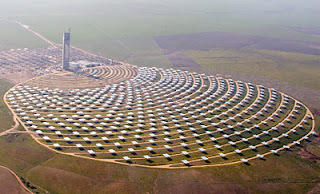 The only conclusion I can draw, is this: to proceed with a new generation of nuclear would be morally wrong, especially where other solutions, including Concentrating Solar Power, are viable, cost competitive, renewable, low carbon and benign. Excellent post. I can never understand people going for nuclear, we know too much now surely about the detrimental effects it has and the risks it poses? Not to mention the inefficiency of nuclear generation. Where is the movement to put energy conservation at the top of the agenda?